Kim Stanley Robinson has long been one of my favorite writers. I don't know if rolling your eyes and being like 'oh, it's science fiction' is something that people do anymore- but yes, he does write science fiction, so if you have hang-ups about genre fiction and get all snooty about it- just be aware. However: if you do have those hang-ups then I can recommend no better starting point for your journey of discovery into the awesomeness that is science fiction than with his Mars Trilogy. Red Mars, Green Mars and Blue Mars chronicle the colonization and eventual terraformation of Mars. Red Mars starts with the journey out to Mars and the initial first one hundred colonists. They are mainly drawn from America and Russia- but there are some other countries represented as well: Hiroko Ai is the botanist from Japan, Michel Duval the psychologist for the colonists is from France. But really, this is a joint Russian-American affair and the key players begin to emerge. John Boone is the first man on Mars from an earlier mission- he's coming back to Mars and this time to stay. He uses his celebrity as the first man on Mars to his advantage, but fame has it's drawbacks. Frank Chalmers is the other powerful figure amongst the Americans. He's more of a Machiavellian political operator than John is and, as more colonists begin to arrive and Mars' population starts to grow he becomes very powerful indeed. For the Russians, there's Nadia Chernevesky, who is an Engineer who loves to build. She is sort of the sensible counterpart to the head of the Russian delegation Maya Toitovna, who finds herself caught between Frank and John in a love triangle that will come to define Maya's character arc throughout the next two books. Arkady Bogdanov is the radical amongst the bunch, advocating for the colonists to create an entirely new way of life on Mars unencumbered by the old ways of Earth. The early days of the colonists on Mars are dominated by debates over terraforming, leads by Sax Russell (who is in favor of terraforming) and opposed by Ann Claybourne, who wants to keep Mars pristine and not wreck it's environment. Ultimately, the powers that be want to go ahead with terraforming, but the fight over it's scope and how far they should go sets up a conflict that lasts throughout the entire trilogy. As Earth begins to be dominated by transnational corporations, the situation on Mars deteriorates as more and more people arrive before they can effectively be incorporated into the emerging Martian society. Red Mars ends as that situation explodes into Revolution and soon, many of the first one hundred colonists are dead and the survivors are forced into hiding. Green Mars sees the process of terraformation evolve to the point where plants can survive on the surface of Mars. It also sees the underground begin to plan and prepare for the right moment to retake the surface, now dominated by the transnational corporations who won the Revolution at the end of the first book. It also introduces a second and third generation of Martians, who would come to play key parts in the effort to launch another revolution- this time with the goal winning independence from Earth. Ultimately, this succeeds- but it's a success that is not without it's problems. A longevity treatment has been discovered and the increase in human life spans combined with the population pressures on Earth are making the demographic situation very untenable. Ultimately, however this is a problem that our heroes get to tackle in Blue Mars. The final book of the trilogy is the one that covers the most time span- though the early portions where they hold a constitutional convention to set up a new government for Mars are fascinating and probably (because I have two degrees in Political Science) my favorite part of the entire trilogy. Robinson hits the accelerator after that and shows us how humanity spreads out into the rest of the Solar System with settlements as far away as Neptune and even Pluto. But not everything is great: the older the characters get the more they see a phenomenon of 'quick decline' where old people drop dead of some kind of heart attack and are unable to be revived. After Michel dies of this, Sax sets about trying to solve the problem, but ultimately decides he cannot conquer death and focuses on memory instead- as the oldest generation is having more and more memory problems the older they get. He is successful at this and the characters gather for one more reunion at their original landing site (now a museum) to regain their memories- and then prove to be a pivotal factor in one last revolution- this one ends peacefully however. I can't tell you how many times I've read these books by now and they are still amazing. 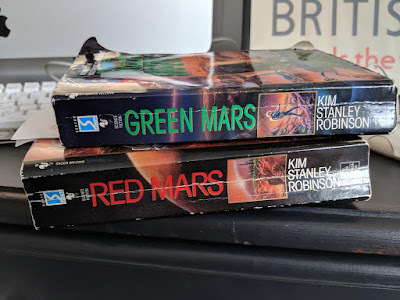 My copy of Blue Mars long since fell apart, so I've had to move that to Kindle- but the ideas that Robinson explores are fascinating and his depiction of Mars and the transformation it goes through is hauntingly beautiful. A blurb on the back of my copy of Red Mars from Arthur C. Clarke says that 'they should be required reading for the colonists of the next century'- which I think is about right, not to mention extremely high praise. What struck me re-reading these books this time around is that they are more a product of their time than I think I realized. The notion that business/corporations would eclipse nation states as the primary movers of power in the world feels like a very late 80s-early 90s notion to play with. It's not entirely wrong: you can only look at the close, almost symbiotic relationship industry has with government in this country realize that Robinson's prediction was somewhat prescient back then. I would argue that they haven't taken that next step to become state actors themselves. Instead, it almost seems like the internet first disrupted the traditional corporate superstructure and now it seems to be reconsolidating and coming back together again, to the detriment of consumers. Could I see us ending up in a transnat/metanat situation as envisioned by Robinson? Maybe. But I feel like more of the symbiosis between government and business will continue- but even that can lead to backlashes at the ballot box- assuming we don't ditch democracy altogether. I also enjoyed Sax's pursuit of a cure for the quick decline as well. It's something that I didn't really twig to all that much in earlier reads- but grappling with the notion that death can be defeated is something that isn't talked about when writers tackle things like longevity. Sax ultimately decides the question is too big, even for him. It's a concept that people play with a lot in science fiction, but there's usually very little exploration of the idea. 'People live longer' shrug, is how it's normally dealt with. Robinson delves into the idea thoughtfully and with powerful effect I think.